Wardner © 1987 Taito Corp.
Two young children, Pyros and Erika, have unexpectedly strayed into a wonderland called 'Wardner's Forest'. Upon entering the magical forest, the young girl is changed into a crystal ball by evil warlock and ruler of the forest, 'Wardner'. She is taken to a secret place deep inside the woods. The brave young Pyros, armed only with a magical flame as a weapon, sets out to rescue his female companion from the clutches of the evil Wardner and bring her safely home. At the end of every level, Pyros enters a shop. 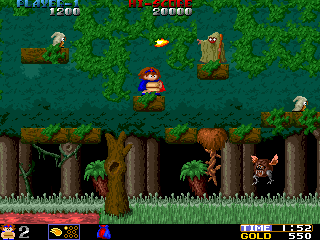 The player can use any gold that has been collected on route to buy useful items; such as extra health, time and more powerful weapons. Wardner is an accomplished and playable platform game with smooth, colourful graphics and finely honed gameplay. This game is known in Japan as "Wardner no Mori [TP-009]" (translates from Japanese as Wardner's Forest) and in US as "Pyros". Toaplan released a limited-edition soundtrack album for this game (Tatsujin : Toaplan Game Music Scene One - H24X-10005) on 25/06/1989. This trick will allow players to get the cape on the first level without the risk of losing a life. Stand next to the hole where the cape is, then hold DOWN and slowly tap the joystick to the RIGHT. If done correctly, Pyros should slowly inch his way underneath the two platforms and can then grab the cape without any problem.